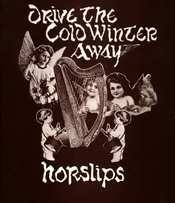 Holiday joy descended early this last week when I discovered that reputable merchants of downloadable music are now offering the complete catalog of the Irish band, Horslips. Active principally during the 1970s, Horslips pioneered "Celtic Rock," bringing electric guitars and keyboards to traditional Irish music in much the way that Fairport Convention and Steeleye Span did for the indigenous tunes on the other edge of the Irish Sea. This is a stereo album . . . . It can be played on mono reproducers or on Christmas Day; or both. Happy Christmas. Drive the Cold Winter Away is available via . The Official Horslips Web Site is filled with information on the history of the band, the post-1970s lives of its members, the [inevitable] legal battles undertaken to recover the rights to their music, etc. One of the most successful of Horslips songs in Ireland was "Dearg Doom," from 1973's The Táin. Seventeen years later, Larry Mullen of U2 recycled a sample of the fearsome "Dearg Doom" guitar riff into "Put 'em Under Pressure," the fight song for the 1990 Irish World Cup team. Video follows the jump, for those who prefer footie to Christmas. Wow, I hadn't thought about Horslips in yonks. I used to have a couple of their albums, back when I thought Steeleye Span hung the moon. Listening to them on iTunes, though, I see that my tastes have changed somewhat. Still, thanks for the reminder. At the end of the day, Horslips is a very '70s band, for good or ill. The cover photo on "Dancehall Sweethearts" is pure Spinal Tap, f'rinstance. What seems to hold up best is the material where they hewed closest to their traditional sources, as on "Drive the Cold Winter" and their terrific first album, "Happy to Meet, Sorry to Part." By the end of their run, they were doing much more generic arena-rock, which really missed the point of what made them unique and interesting in the first place. And don't get me started on Steeleye Span: Maddy Prior's singing can still reduce me to quivering jelly. Yeah, I liked the stuff off of *Happy to Meet Me...* best. I'm more of a June Tabor girl, myself. One of the happiest days of my life was when iTunes added the June Tabor/Martin Carthy joint album.